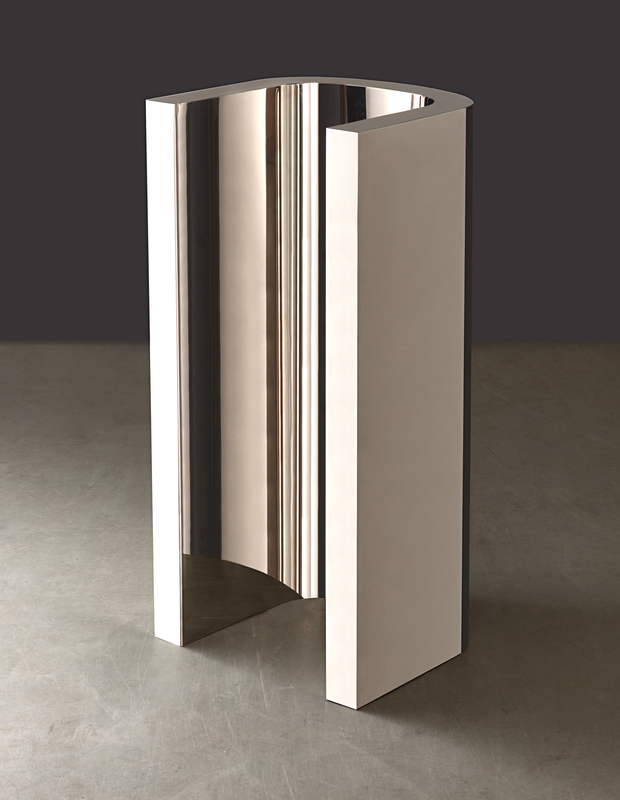 » New York – AO Auction Results: Phillips Contemporary Evening Sale, Thursday May 16, 2013. - AO Art Observed™ New York – AO Auction Results: Phillips Contemporary Evening Sale, Thursday May 16, 2013. Home » New York – AO Auction Results: Phillips Contemporary Evening Sale, Thursday May 16, 2013. 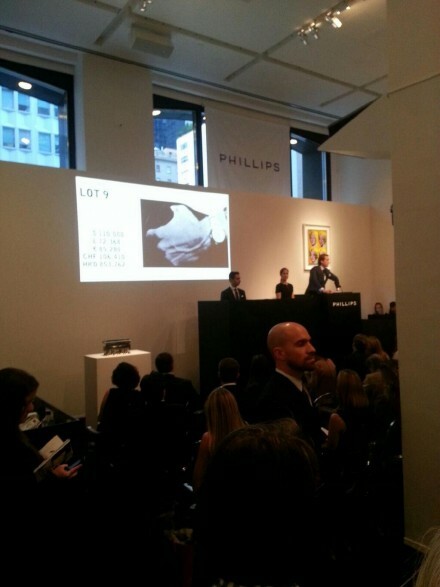 New York – AO Auction Results: Phillips Contemporary Evening Sale, Thursday May 16, 2013. 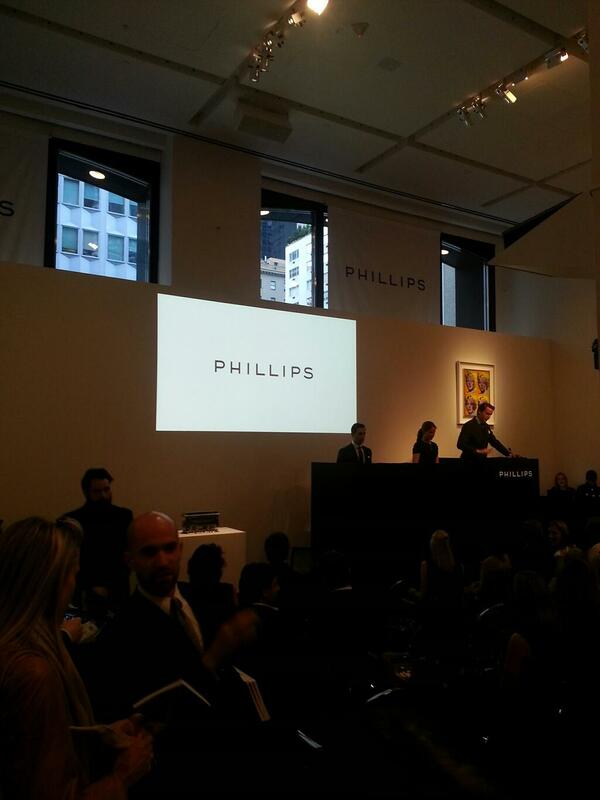 Last evening, Philips held its contemporary art sale at its Park Avenue headquarters, offering a total of 37 lots. The sale concludes a very successful run of strong contemporary art auctions in New York during the past week, and the saleroom was high in energy and anticipation as a result, a clear carryover of enthusiasm from the ground-breaking sale held at Christie’s the previous evening. Wade Guyton, U Sculpture v. 5 (2007), courtesy of Phillips. The sale at Phillips began with a Wade Guyton’s U Sculpture (v. 5), (2007) selling for $15,000 over its high estimate at $365,000. Christopher Wool’s slightly obscene And if, (1992) hammered well within its estimate at $4,085,000, but a second work, Untitled from 1999 went well above its projected price, landing at $1,685,000. Others selling above their high estimates included Glenn Ligon‘s Stranger Drawing #7, ($509,000), Lucio Fontana‘s Concetto spaziale, Attese ($1,565,000), Andreas Gursky‘s Rhein ($1,925,000), Kelley Walker‘s I see an attacking bear thing ($341,000), and a mesmerizing Mark Grotjahn- Butterfly, which sold for $173,000 over its high estimate at $473,000. 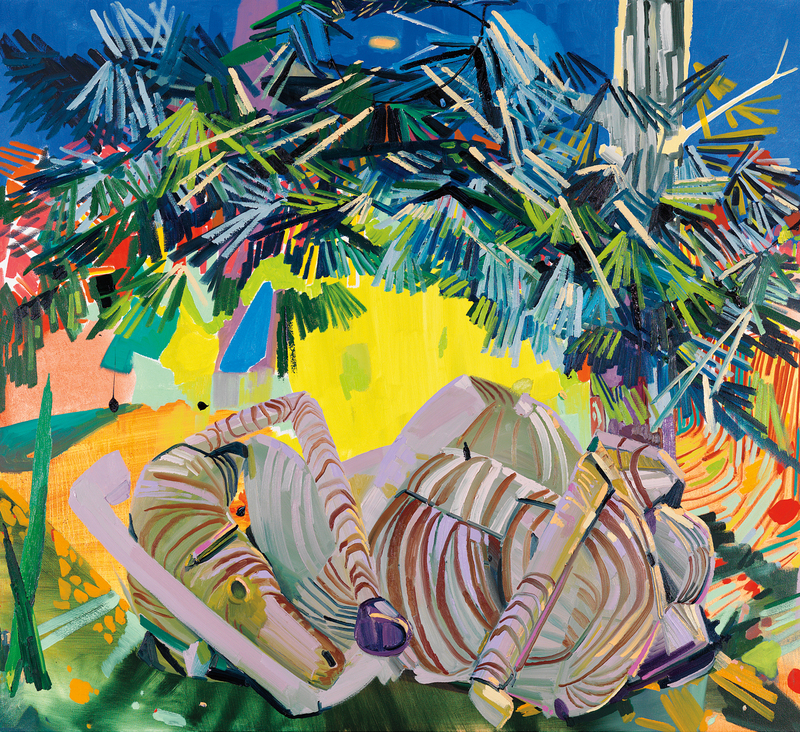 Also of note was Dana Schutz, the lone female artist in the sale, whose work sold over estimate for $365,000. Dana Schutz, Dead Zebra (2003), courtesy of Phillips. The evening proceedings were led by a dashing Alexander Gilkes, marketing director and auctioneer at Phillips and co-founder of Paddle8. It was the first contemporary art sale for the auction house not led by Simon de Pury, who led the company from 2000-2012. It was de Pury who focused the house’s efforts to specializing in modern and contemporary art and design under the name Phillips de Pury, and while he was known for his theatrical style on the rostrum, Gilkes did not disappoint, keeping energy high in the room throughout a sale that lasted just over an hour. Present in the crowd was dealer Larry Gagosian, British jeweler Laurence Graff and singer/artist Courtney Love. Andy Warhol’s Marilyn Monroe portraits made multiple appearances during the auction, and commanded an impressive share of attention. 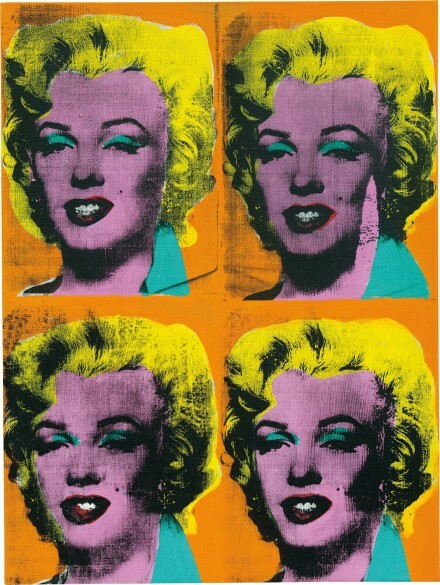 Mild applause broke out as Andy Warhol’s Four Marilyns sold for $38.2 million to a woman in the room. The painting had previously been estimated at $30 million, the estimate was raised an additional $5 million after the auction successes of the past week. Marilyn Monroe (Marilyn) also sold, commanding a price of $2,045,000, well over high estimate of $1,800,000. Jean-Michel Basquiat Untitled (Soap), (1983-84), courtesy of Phillips, which did not sell at yesterday evenings auction. Out of the 37 lots on sale, only 7 failed to sell. 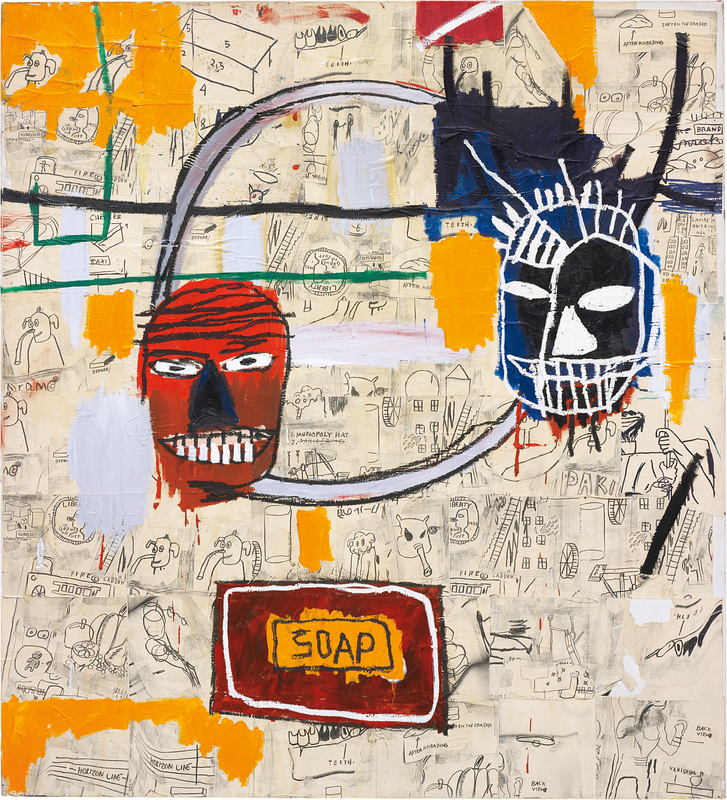 After Jean-Michel Basquiat’s Dustheads record-breaking hammer price at Christie’s on Thursday (nearly doubling it’s estimate at 48,843,750) it is a surprise that the Basquaits on offer at Philips, Untitled (Soap) was unable to find a buyer. Other passed lots included Cady Noland’s, Industry Park, an Alexander Calder mobile, a Phillip Guston, a James Rosenquist, as well as one of Damien Hirst‘s spot paintings, Sulbenicilina Disodica. This week’s sales have proved to be a break-through for contemporary art. Wednesday’s auction at Christie’s set a new world auction record, with many new artist auction records, including the $58,363,750 million paid for a Jackson Pollock drip painting at Christie’s, or the $43,845,000 Barnett Newman which was the top lot at Sotheby’s. The next series of auctions take place next month in London. This entry was posted on Friday, May 17th, 2013 at 3:50 pm	and is filed under Art News. You can follow any responses to this entry through the RSS 2.0 feed. You can leave a response, or trackback from your own site.